The Gleason Lodge is located on a secluded hillside with a magnificent view of the Bristol Valley. The Great room of this building provides an elegant and spacious meeting place, with its stone fireplace, high ceiling, and bookshelf-lined wall. It can accommodate up to 73 people for social gatherings and 50 people for day-long meetings, seminars, or workshops. The Lodge also includes a dining area that seats up to 25 people and a commercially equipped kitchen. The Gleason Lodge is equipped with an accessible path and bathrooms. 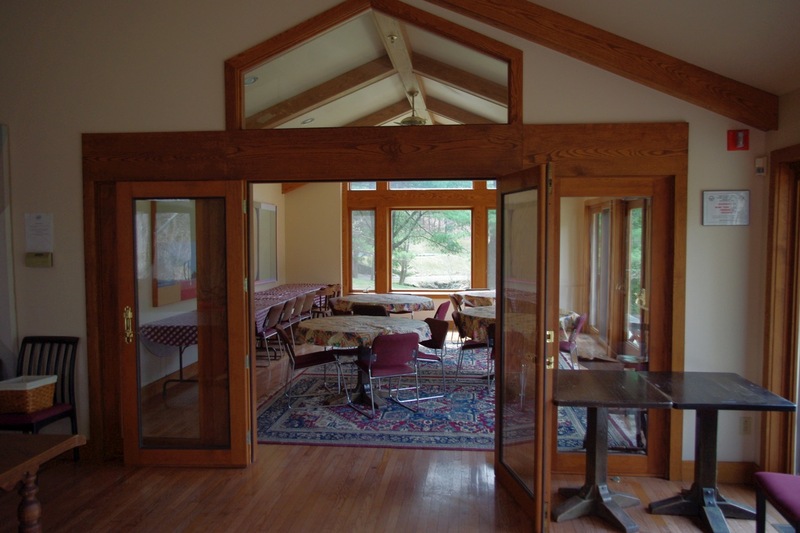 Surrounded by fields and woods, the Gleason Lodge provides the ideal environment for groups seeking a unique and refreshing experience. 1 – 24 people: $300/$350 – W&B Member Rate/Public Rate. 25 – 45 people: $400/$450 – W&B Member Rate/Public Rate. 46 – 73 people: $550/$600 – W&B Member Rate/Public Rate. 74 + people: $800/$900 – W&B Member Rate/Public Rate. For all bookings, $100.00 security deposit is required. To have lodge set up a specific way for your event, it must be indicated when signing rental contract. No pets on premises at all, and no smoking allowed indoors. Two outdoor grills are located near the Gleason Lodge. Just Poets is always enthusiastic about spending an autumn day at the Gell Center. We had another awesome retreat; the lodge and its surroundings are a perfect place for us. We made coffee in the kitchen, then settled around the fire in the morning to write, moved to the dining area to sit together for lunch, enjoyed walks up the hill in the early afternoon to write some more under the trees. We held a reading of poems at the end to mark the day. Thanks for supplying a great facility to us.